Haptics. It's the science of touch. What we know about haptics is based on extensive research and the findings are fascinating. Why should communicators (aka writers) care about haptics? According to neuroscientist Dr. David Eagleman, "Human touch represents a powerful form of non-verbal communication." Which is why you should take a look at A Communicator's Guide to the Neuroscience of Touch, a project of Sappi North America in collaboration with Dr. Eagleman. It's a quick read--just 50 pages--with many illustrations. While you can read it online, the printed version is, of course, an excellent example of haptics-in-your-hands. Here's where it gets really interesting for those of us who write for both digital and traditional print media. According to Ferris Jabr, whose article "Why The Brain Prefers Paper" appeared in Scientific American, "People understand and remember what they read on paper better than what they read on screen. Researchers think the physicality of paper explains the discrepancy." Studies show people read best on paper for three reasons: it makes content more intuitively navigable; it facilitates better mental mapping of information; and reading on paper drains fewer of our cognitive resources, making retention a little easier. You're invited to watch Dr. Eagleman discuss how the medium shapes the message--online versus paper. Before showcasing examples from three haptic brands (BMW, Apple and World Wildlife Fund), the Guide reminds us, "The main job of communicators is to identify what is unique, and good, about a brand and create a program that reveals it clearly. A communicator's tools are words and ideas, expressed through typefaces, colors, and form, delivered on a medium that further shapes the content it carries. With so many media vying for a share of brand dollars, communicators sometimes look to science to help assess the alternatives." I wish I'd written that. It's a super succinct description of what marketing communicators do for a living. Full disclosure: Ink-on-paper is in my DNA. I'm the daughter of a postmaster who started my career as a writer of catalogs and direct mail. That said, I fully appreciate the immediacy, brevity and linkability of my words delivered digitally. But learning more about haptics has reinforced why I continue to enjoy writing--and reading--words on paper. One more thing. 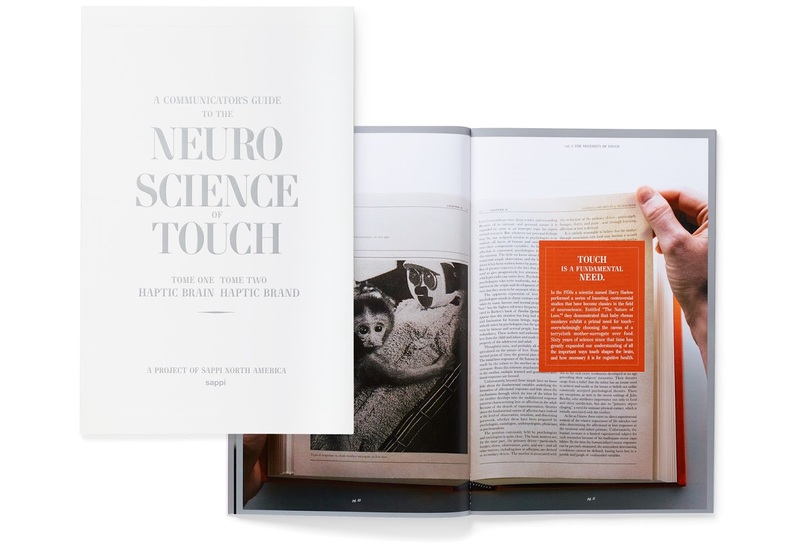 A big shout out to the writers, designers, researchers and creative strategists at Rigsby Hull, the communications firm instrumental in creating A Communicator's Guide to the Neuroscience of Touch. They are haptic hotshots. By the way, A Communicator's Guide to the Neuroscience of Touch is free for the asking, but it was published in 2015, so print copies are limited. Of course, you can also download the content. But trust me, it's not the same as the touchable ink-on-paper version. It's all about haptics.